The Laugavegur is a famous trekking route in South-West Iceland from the hot springs area of Landmannalaugar to the glacial valley of Þórsmörk . It is noted for the wide variety of landscapes on its 55 km (34 mi) path. The route is typically completed over 2–4 days with potential stops at the mountain huts at Hrafntinnusker, Álftavatn, Hvanngil and Emstrur. An ultramarathon is held on the route each July. 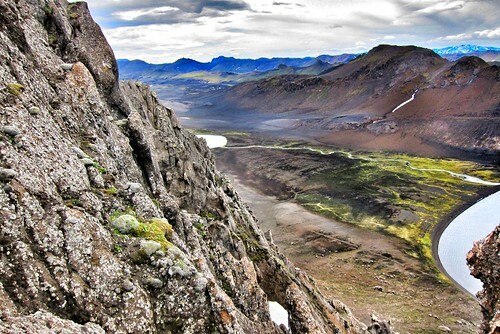 It is possible to combine the trek with the Fimmvörðuháls route which goes over the pass from Þórsmörk to Skógar for an additional one or two days or an additional 25 km (16 mi). Landmannalaugar, Þórsmörk, and Skógar are all reachable by bus during the summer. A bus from Hella connects with Álftavatn once a day during the summer.